Lucas van Leyden (Dutch, 1494-1533): Old Testament and Miscellaneous. Lucas van Leyden is the first great Renaissance master printmaker produced by the Netherlands. Something of a child prodigy, he was first influenced by Albrecht Durer's works toward the end of the first decade of the sixteenth century. In 1521, Lucas and Durer met during Durer's trip to the Netherlands to try to win the support of the new Regent of the Netherlands for the renewal of the pension granted him by the Emperor Maximilian I. We know from Durer's diary of the trip that they met and enjoyed each other's art and company. 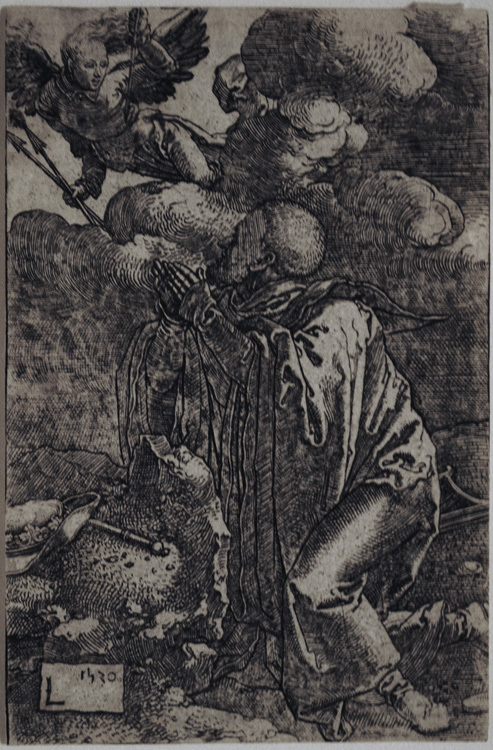 After Durer left, Lucas was again challenged by the quality of Durer's works to rethink his engraving. Lucas combined the native Netherlandish tradition with Durer's inspiration and the Italian style that Jan Gossaert had brought back with him when he returned from Italy after the death of Pope Adrian VI, and gave birth to a style that dominated Netherlandish printmaking for almost 100 years (thanks, in part to a Lucas van Leyden revival led by Hendrik Goltzius and his followers, Jan Saenredam and Jan Harmendsz Muller). One of the greatest printmakers of the Renaissance. Select Bibliography: Suzanne Boorsch & Nadine M. Orenstein, The Print in the North: The Age of Albrecht Durer and Lucas Van Leyden (NY: Metropolitan Museum of Art, 1997); P. van der Coelen, Patriarchs, angels & prophets. The old testament in Netherlandish printmaking from Lucas van Leyden to Rembrandt (Amsterdam: Museum het Rembrandthuis, 1996); F.W.H. Hollstein, The graphic art of Lucas van Leyden 1494-1533 (Amsterdam: Menno Hertzberger, n.d.); F.W.H. Hollstein, The new Hollstein Dutch & Flemish etchings, engravings and woodcuts, 1450-1700: Lucas van Leyden (Rotterdam: Sound & Vision Publishers, 1996); Ellen S. Jacobowitz, and Stephanie Loeb Stepanek, The Prints of Lucas Van Leyden and His Contemporaries (Washington D.C.: National Gallery of Art / Princeton: Princeton University Press, 1983); J.P. Filedt Kok, Lucas van Leyden - Grafiek (Amsterdam: Rijksmuseum, 1978); Jacques Lavalleye., Pieter Bruegel the Elder and Lucas van Leyden: The Complete Engravings, Etchings and Woodcuts (NY: Abrams, 1967); Elise Lawton Smith, The Paintings of Lucas van Leyden. A new appraisal, with catalogue raisonne (Columbia: University of Missouri Press, 1992); Maria Fossi Todorow, ed. 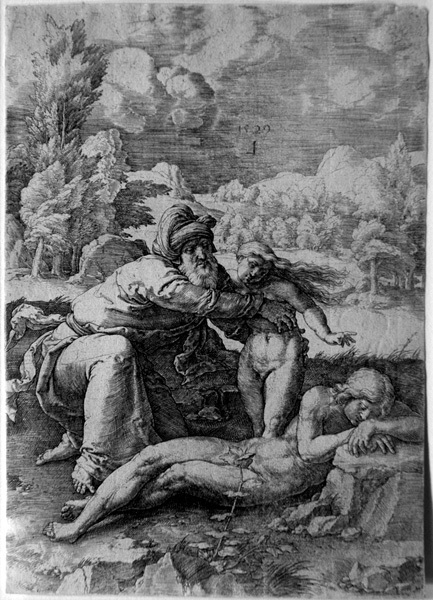 Mostra delle incisioni di Luca di Leida (Gabinetto Disegni e Stampe, Uffizi: Cataloghi. 16; Firenze: Leo S. Olschki, 1963). The Creation of Eve (Bartsch 1, New Hollstein 3d i/iii). Original engraving, 1529. First state (of 3) on laid paper with the small jug watermark; thread margins or trimmed to the plate mark. A very good impression of this scarce print. Image size: 163x115 mm. Price: $9500. 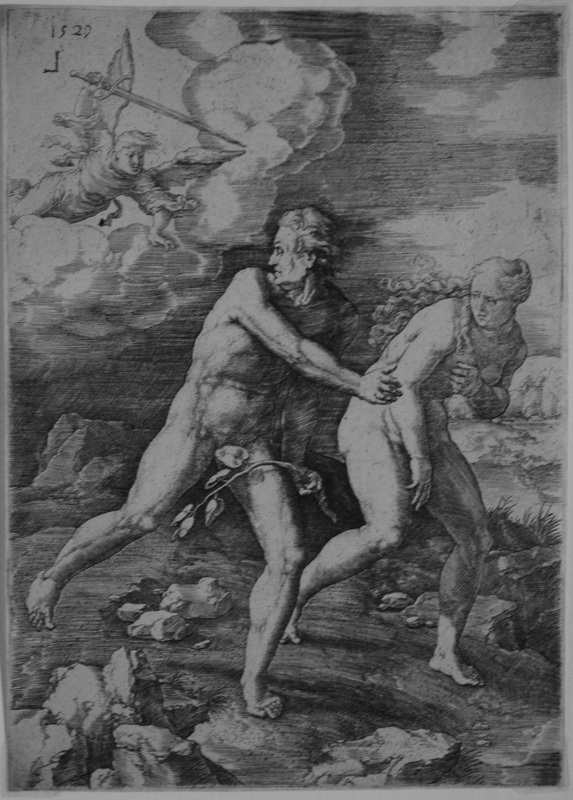 The Expulsion (Bartsch 4, New Hollstein 4: 1b) Original engraving, 1529. First state (of 3) on laid paper with the small crowned shield with three fleur-de-lys watermark; thread margins or trimmed to the plate mark. A very good impression of this scarce print. Signed with the reversed "L" and dated 1529 top left. Image size: 163x117 mm. Price: $9500. David Praying (Bartsch 29, NGA 76). 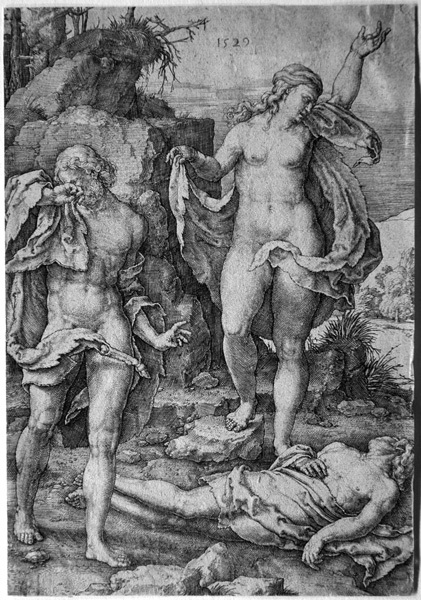 One of only 6 etchings executed by Lucas, the National Gallery of Art catalogue, The Prints of Lucas van Leyden and His Contempories calls it an amazing accomplishment in the etching medium. Ours is a strong impression on laid paper, trimmed on or within the border. Signed with the "L" and dated 1530 lower left. Provenance: von Liphart (Lugt 1687) & Landsinger (2358). Image size: 115x74mm. Price: $12,500. 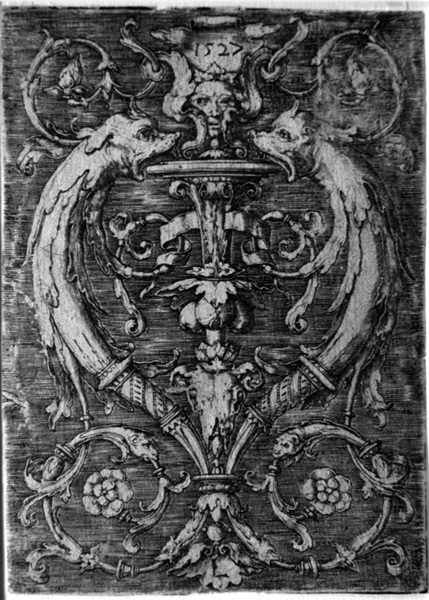 Ornament with two dolphins (Bartsch 161, New Hollstein 161). Original engraving, 1527. Very good strong impression on laid paper, trimmed on or within border. Dated 1527 top center and signed with the "L" bottom center. Image size: 112x81mm. Price: $3500. 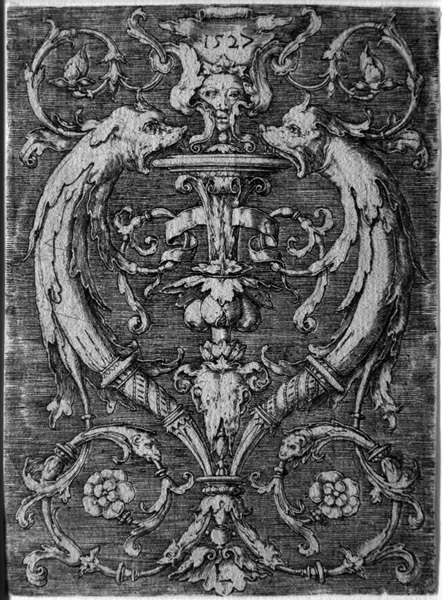 Ornament with two dolphins (Bartsch 161, New Hollstein 161). Original engraving, 1527. Good strong impression on laid paper, trimmed on or within border. Dated 1527 top center and signed with the "L" bottom center. Image size: 112x81mm. Price: $3000.